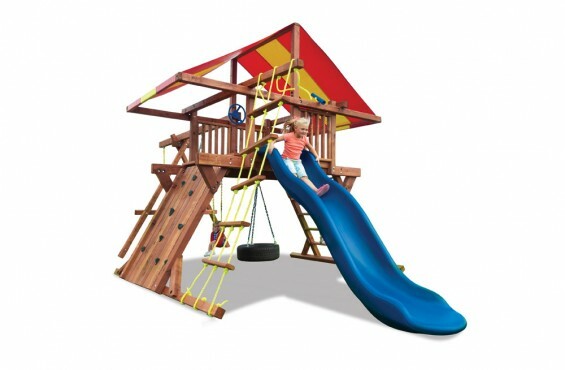 Multiple play areas for kids to swing, slide & play all day. 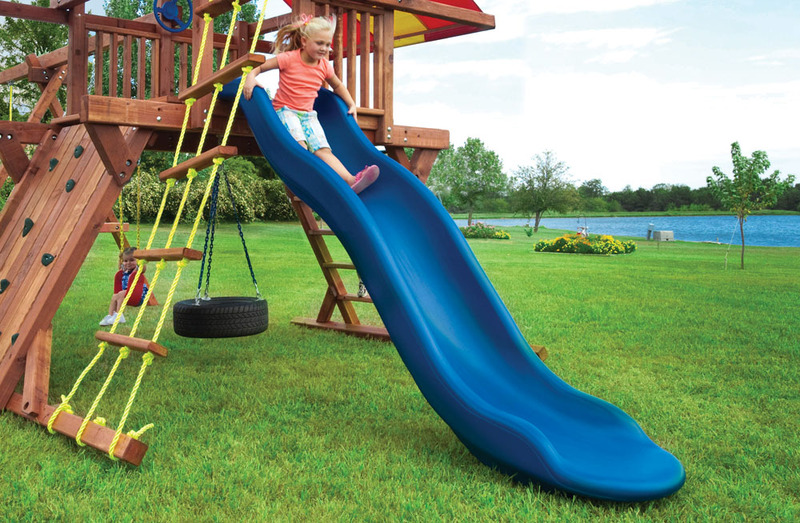 Safe, healthy fun is what you get with the Pot O' Gold outdoor playset. This high quality playset gives kids a rope ladder, a climbing wall, and a sturdy redwood ladder with interlocking steps to take them to the top of the 10 ft. wave slide. For more diverse play, kids can enjoy the thrill of the swiveling tire swing with three of their closest friends. To compliment the many adventurous play activities is the imaginative steering wheel and telescope that resides comfortably underneath the multi-colored canopy. Youngsters can enjoy hours of exercise and recreation swinging on the tire swing, or the two belt swings. Made from the same splinter-free, hand-sanded redwood as all of our products, this outdoor playset will entertain your kids for years to come. We design our outdoor playsets to bring the excitement of the common playground to backyards across America. However, we have become the most respected playset manufacturer in the U.S. by putting safety first, always. As an active ASTM safety committee member, we have gone beyond the normal safety guidelines to ensure your kids are always safe. Here are the safety features included on our playsets. While our wood playsets are hand-crafted to eliminate unnecessary cuts and scrapes, we suggest adding a fall surface under your play structure to add another layer of protection for children – just in case they lose their balance and fall. 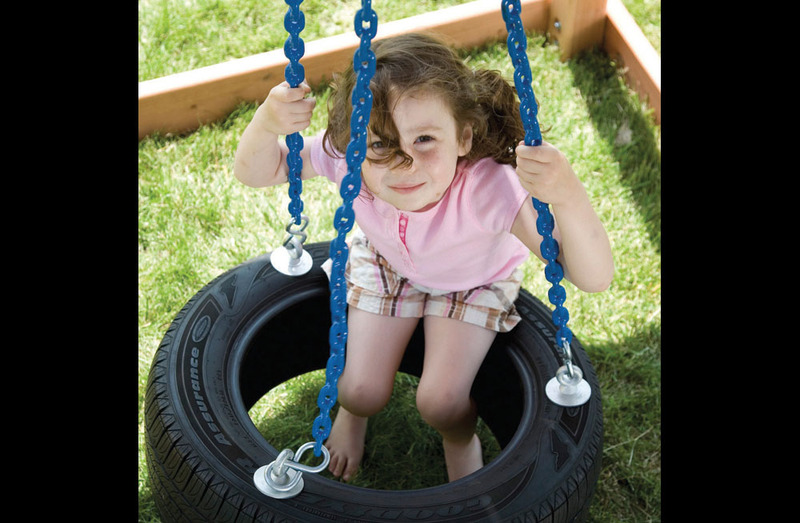 We recommend to add rubber mats, rubber mulch, wood chips sand or pea gravel under your playset with tire swing. To see a pros and cons list of the best materials for under a playset, check out the resources tab on this page. For a detailed guide on playset fall surfaces, be sure to check out our resources tab on this page. This outdoor playset for kids is not intended for public use. It is intended for residential use and is not warrantied for public or commercial use. The amount of space needed for a safe play experience may vary for each playset, but we suggest following ASTM’s guidelines of having a 6’ safety area around your playset. This area should not include any obstructions such as trees, plants, sheds or any other structures. In addition to the safety benefits of a 6’ clearance, it gives kids space to run around in your backyard all day long. 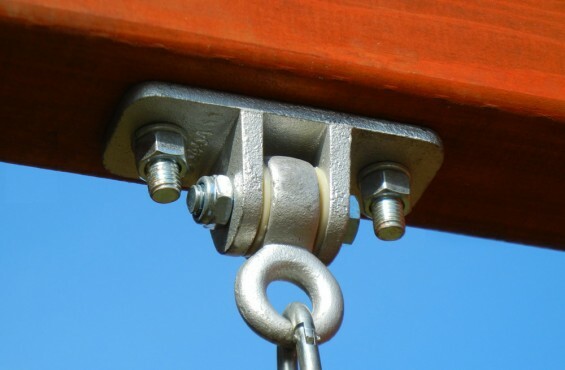 We also offer professional installation on our Premier Redwood Series of swing sets for $299. Periodic maintenance is suggested to ensure safe enjoyment of your playset and optional accessories. Be sure to check out wood playset maintenance checklist within the resources tab on this page. Checking, splitting and surfacing cracking are characteristics of all playsets. This is caused by varying seasonal temperatures and moisture conditions. 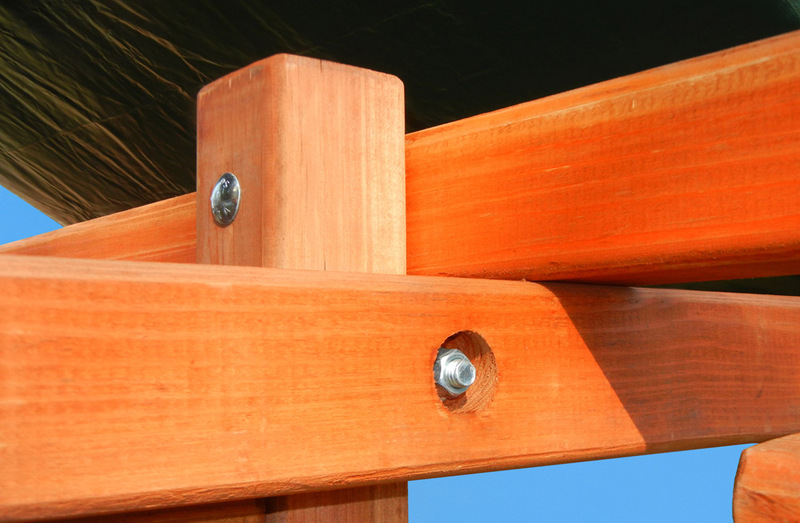 To minimize this checking and/or cracking, you may coat your playset with a water repellent. 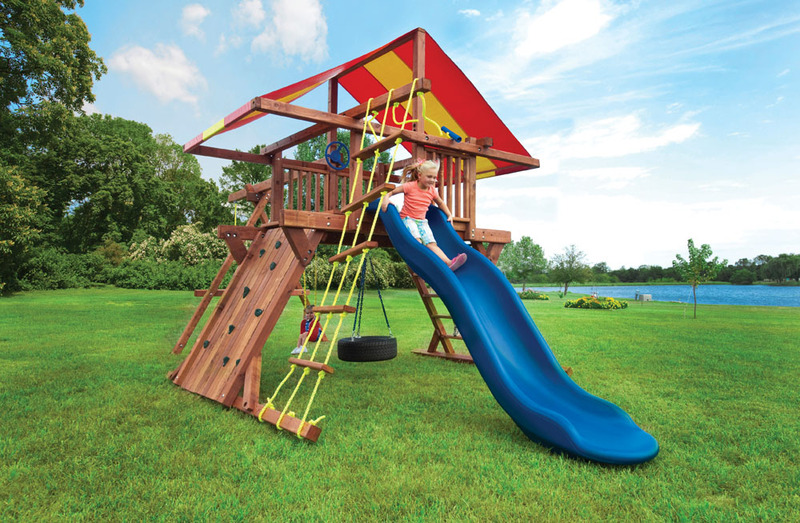 The Pot O' Gold outdoor playset is factory stained to provide a beautiful finish and long lasting protection. We recommend staining swing sets once a year to maintain its rich color and naturally resilient qualities. Prior to staining, clean all wooden components. Use a high quality water based stain or sealant such as Thompson’s Water Seal® . After staining or sealing, please allow 24 hours to dry before allowing children to start their adventure. Thanks for the help with my order. Everything went together pretty well in 8 or 9 hours. The longer pieces to accommodate our slope worked out awesome!! We love our playset and so do our children. They are young and this is one that will last them as they get older. Great quality and loads of fun for them to play on. Plus, parents can climb on it to help little ones and not worry about breaking it. A great swing set that will last for years to come! 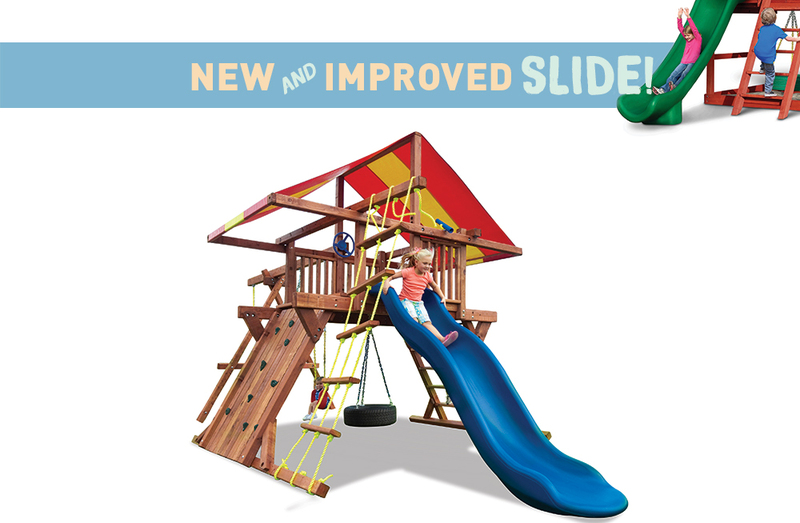 We purchased the Pot O' Gold play set to replace another brand that was destroyed during a severe storm. The price and features were about the same as the one we replaced, but the quality of the Pot O' Gold is far superior. The wood beams are all larger cuts, the footprint and frame feels much sturdier, and even the hardware is heavier. It feels and looks like it was made to last. I’m not happy I had to replace the other one due to storm damage, but I think we ended up with a better play set. The last one was supposed to be able to hold adults, but I’m a big guy and didn’t really trust it. This one I have no worries about climbing onto the deck with the kids. My 6-year old son and my wife and I put it together ourselves sharing one cordless drill and impact wrench. We set aside a whole weekend to put it together since you never know what you will get into. The instructions were simple and easy to understand. We had the whole thing put together in about 4 hours. The last one took about 8 hours with a crew of 4 guys helping who each brought their own cordless tools. The boards were inconspicuously stamped for identification and while there were a couple different sizes of hardware, most used the same types, which makes it easier to put together when you don’t have to sort and measure each board and screw because there are 50 different types of both being used. I would recommend this play set to anyone who wants a solid, good looking play set for a good price that they can put together themselves. The kids love it and it looks good. This swingset is great! Great quality swingset. We are so glad we purchased from Kids Creations. Good instructions. My husband had it up in an afternoon an mostly by himself! We have had our swingset for about 4 years now and it still looks as good as new. We stain it every other year to keep it protected by that's all we do! Thank you Kids Creations for all the fun my kids have had on their swing set! We bought the swing set for our grandchildren, ages 5 and 4. We were able to design exactly what we needed for our space. Our previous one had been there for 30 years and we thought we would never be able to find another constructed as well but, I believe this one will be here another 30 years!!! Everyone were very helpful will our order and the installer was great!!! Thanks for helping make more memories!!! Eveytime the company was great to work with and sent replacement parts at no cost quickly. Good swing set great company.